In the middle of a lake in Amsterdam is a collection of artificial islands called Ijburg. It is Amsterdam's newest city, only constructed in 2013. Once a deserted island, now it is on this new city artists Joris Brouwers and Nicky Zwaan decided to build their own home. The architecture is Brutalist inspired, where the exterior is a massive asymmetrical concrete facade that is unadorned and has slits of windows to let in natural light. This curious structure is made of wood, glass, and concrete made to withstand the strong winds and has an impressive interior that is a refuge for a modest living. Each room is well utilized for their own use and kept for a sustainable living. There is minimal decor, it's walls almost bare, apart from indoor plants and wooden artifacts. When it comes to architecture, there are exceptions. 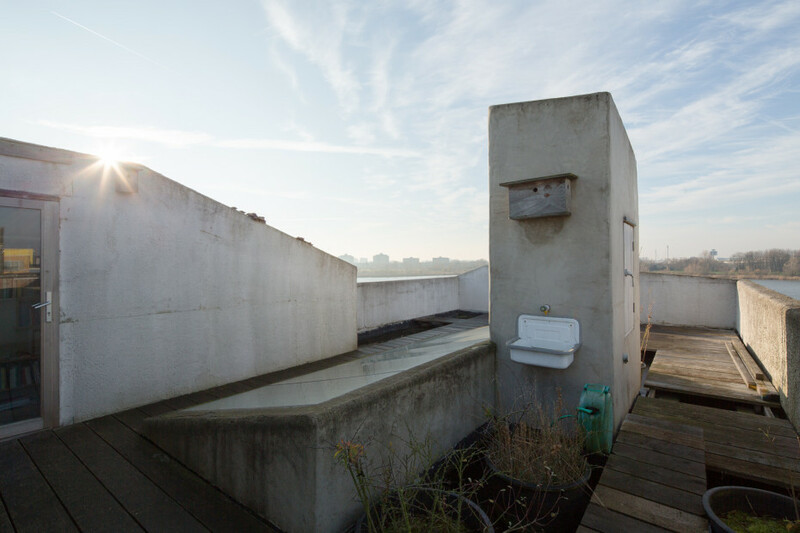 Artists Joris Brouwers and Nicky Zwaan made their bet on IJburg seven years ago when the city offered a limited number of open plots: build whatever you want. Most people hired an architect and construction company, and erected their dream house. Joris and Nicky took matters in their own hands, and designed, built, finished, and furnished their house almost completely themselves. The result is an impressive yet modest dwelling that fuses visual design with architecture, and high-end sustainability with ancient construction materials. Read their interview on Freunde von Freunden, also featured on their book: Freunde von Freunden: Friends (order within Germany here) for more comprehensive details about their home.